Disney gave us warning in advance if we wanted to be part of this program and allowed us to pick our own Magic Band colors and have our name printed on the back. It costs nothing, but it was a fun touch. If general efficiency is the name of the game, this is a godsend. Instead of fumbling around with multiple cards for Fastpasses, room key, ticket, and Photopass, you now have everything on your wrist. They currently still give you a room key as backup just in case, but putting your wrist to registers, cameras, and room door really make the vacation a little easier. I found it helpful when I was carrying groceries up to our second floor room at Old Key West. Just a tap of the wrist opened the door. The wrist band also can work on some attractions like Test Track. Disney links everything though My Disney Experience while also allows you to make extra Fastpasses (Fastpass+) if you are staying at a Disney resort. This is particularly helpful because it also knows when your dining reservations or other special events are happening and will spit out a time that should work for you and your family. It also is nice because if there are attractions you really want to experience (Everest, Soarin', heck, Captain EO), you now have the ease of knowing you will get to ride. The two aspects that never failed when we were there were the Photopass and the room key. Things that I am considering "bad" were things that worked sometimes, but not consistently. This is the case with the Fastpass+. On the surface, Fastpass+ works beautifully when making your selections for up to a week in advance. However, it appears that you always have to pick three attraction (no more, no less) and they have to be from the same park. This does spread guests throughout the park, but I found it greatly increased traditional Fastpass times (which you can still do, but only one at a time). The problem is that guests are really not penalized if they do not show up to the Fastpass+ times. At least the traditional Fastpasses lock you out for about an hour. Changing Fastpass+ times due to down attractions was a bit of a nightmare. My Disney Experience would drop some of my family from Fastpass+, change the times, and lock us out from making changes. If you had proof on your phone for the times, Cast Members gave you the benefit of the doubt and wrote down your band number for a "problem" in the system. Their list was a bit long. I am pretty sure that Disney can fix this, but the system is a bit buggy. The register scanners sometimes didn't work (20% of the time), but that could have been just a fluke. If there is one person that you do not want to ask about the Magic Band experience, it is my mother. Because she is the DVC member, she made the reservation on her Disney account. I made the dining reservation. While everything transferred over to my account, the system could not reconcile that "Laura Murphy" was on two different Disney accounts and basically crashed her Magic Band before stepping into our first park. It took 45 minutes to check into Old Key West because they could not get her band to work. In the end, they had to give her a new gray generic band so that she could open the room and link her tickets. For some reason, she had to use her Key to the World Card to charge. She was not happy. 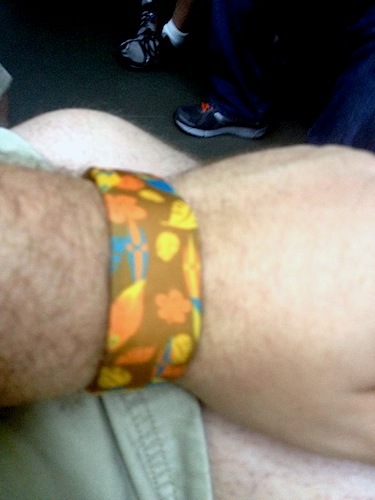 Also, because we are Annual Pass Holders, we had to get the bands linked not at OKW, but at our first park (DHS). That took another 45 minutes for three people because they were "having trouble with the system." As we entered the park, my mother's and my Magic Bands would not let us into the parks. They scanned the wristband with their iPads and let us in. It took another 10 minutes before our Fastpass+ came up for us to make selections. We also noticed that whenever we tried to get paper Fastpasses (using our Annual Pass ticket card -- given just in case! ), it would not accept my mother and my ticket. The next day, we went to EPCOT and found out that they messed up our cards and had to issue new ones (which then had to be linked to the Magic Bands). All in all, we wasted nearly 3½ hours of our vacation getting this bands to work. We are pretty knowledgeable about Disney World so if it took us 3½ hours, what about the guest coming for the first time? We found out that we were not the only people having problem with the bands as we heard from other DVC members who were cursing the program. Cast Members also looked perplexed with the bands making me think that we were not the first to complain. They also appeared to be pretty uneducated about the program with only have two (yes, TWO) cast members per park that were assigned to help with the bands. I have never seen such long lines out of Guest Services in the life. I really don't know how I feel about the Magic Bands. They either worked very well or majorly failed, with nothing in between. It is still in its testing stage so it is being actively worked on. If you are a new guest to Walt Disney World, you should still do it since you are starting out fresh with Disney. If you are like us who have DVC, annual passes, and Tables in Wonderland, I would tread with caution until the bugs are worked out. November 4, 2013 at 3:01 PM · You sound like you had an unusually ruff time. I am an annual passholder, and have used the magic bands nearly a dozen times, and almost every time, it worked flawlessly. Sure there were moments where we had to fix something, like a fast pass time, but usually the cast members made up for it by giving us an additional fastpass. Regardless, it is a new system and clearly has some kinks in the technology. November 4, 2013 at 3:36 PM · Whew... I am just glad this TPI post was not another report about the stinkin' Rao Family! I've had it up to "here" with those weirdos!!! Interesting article, Anthony. As you stated there are still a lot of tests and changes still to come. Kinks will be ironed out and things should improve. The system definitely has promise...only time will tell if that promise will be fully realized and applied to the average visitor. Anyway, seems like this is a primer on what NOT to bother with as far as the 'Magic Bands' go. I'll be foregoing this in favor of minor inconveniences. It's a test so things are expected to go wrong and that's ok if Disney compensates you, but the fact that only 2 members per park where there to assist is bad. They should expect hiccups and need to have enough knowledgeable experts at had to log and investigate the problems and get the guests up and going as quick as possible. November 4, 2013 at 4:52 PM · I have used the MagicBands twice, and haven't had a problem yet with them. The first time I used it for the room key, charging, and for my ticket to mickeys Halloween party, and tried to use it for the FastPass but that wasn't available during the event. The second time was just as a room key, and no issues there either. I'm sure once you get into lots of addons it becomes more complicated, sorry you had a bad experience with it. Let me first say, my family did not hate the Magic Bands. We will be keeping them with the hope that it will improve in May. However, I wouldn't put us down as fans. While it was a test, I found Disney really using that as more of an excuse as I heard it way too much. I think we entered into the testing phase when DVC and everybody else in the resorts start using it (OKW was one of the last). Probably a good move leaving the more complicated resort guests til the end. My mother's arguement can be summed up by the phrase "all that lost time we could be on a ride". Since we are lucky enough to go to Disney a couple times a year, we were not really too posessed about getting onto attractions. We did Fastpass+ Fantasmic which sort of worked. Ironically, My father's wristband never acted up. His was perfect. My concern is that the system seems to work for the first time guest, but not repeat. The root of the problem is that website. They need to fix that website! November 4, 2013 at 5:50 PM · This may seem like an odd question, but how comfortable were they? My wife and I visited Epcot this week and it was a breezy cooler day around 80, but I noticed I was still sweating around my wrists. I think I would go nuts in the summer if I had to wear those things all day. Do you HAVE to have them on your wrist? Could I keep it in a bag, as long as I am happy to fish it out? November 5, 2013 at 5:45 PM · Kelly, you do not have to have them on your wrists. They work just fine being held in your hand. And I don't see how you can think Disney doesn't like its off site guests money. All theme park resorts offer more for people who stay at their hotels. Universal has early Potter admission and the Universal Express pass costs extra. Disney is actually very fair. They offer regular fastpass's to everyone, which is more than I can say for Universal (who is also quite fair). Of course you are going to get more if you stay on their property, you pay them more. You pay less, you get less, simple as that. November 5, 2013 at 5:55 PM · Keeping it on is like wearing a watch. As you can see in the picture, I have a special skin around mine (Tiki Room). Also, and I know it was mentioned, its just another perk that Disney gives to their on site guests. All resorts do that. The only new "perk" from the band is that you automatically get three free fastpasses. I am not sure if that is going to sway anybody, but there are definite perks for staying on grounds. November 6, 2013 at 10:09 AM · Unfortunately, from what I have read, this info is already out of date. WDW is now limiting FP+ in EPCOT to 1 (one) per day for "major rides" and two for "minor" rides. So no FP+ for Soarin and TT in the same day. It also seems that more FPs are being pulled out of the regular system. And there are moves to pull out the paper FPs altogether. The ability to double up (paper FP and FP+) is being curtailed, and will probably be completely unavailable soon. I have read numerous accounts of nightmares with the Magic bands. And basically, WDW does not care. Too bad if you lose hours and hours of your precious vacation. WDW does not care. November 7, 2013 at 3:29 PM · I stayed at The Beach Club in September with family and again in October with my husband. Both times I had the magic bands and they worked ok, with but minor problems. My real concern was with the Fast Pass+ advance reservations. What Disney is doing with this is changing the whole concept of a day in the park with friends, family with no need to be anywhere at any special time and to enjoy the park and ride some rides at our pleasure. Having to reserve ahead of time, and at at least a day in advance destroys this park enjoyment. Also, I found the standby lines very lengthy and slow due to the constant large numbers of fast passers they were letting in, eg., Toy Story, where we waited in standby for 45 minutes with nary a movement of the line. We finally left in disgust. The end result of the fast pass plus will be long lines in the fast pass lanes and little chance of getting on a ride in the standby lanes. I like the abilities the magic bands can give us as far as opening our room doors, entrance into the park, etc. etc. However, I think Disney made a huge mistake and spent much money on changing the fast pass system. They could have, and should have just left it alone. The paper fast passes are ok if you must, but to book a ride 6 months in advance is just plain dumb and will only serve to anger those of us who want the ability to "play it by ear" when in the park and not be subservient to some darned reservation. Keep the bands but Disney had better do something about the fast pass system or they will lose many of us. We go twice a year from Michigan but if I have to stand in line for an hour or two for some ride, we will bypass Disney and go elsewhere on our vacations. We don't visit WDW to be hassled.